Every year some amazing builds are open to view at the Burning Life festival. But I am not going to tell you about the best builds or the most interesting displays. Instead I am reporting on interesting uses of particle effects. 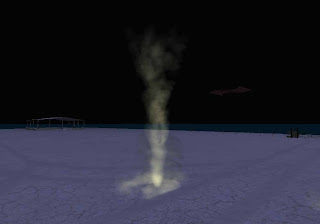 I flew around several of the many Burning Life sims in search of cool particles. By no means did I see all of the displays; I’ll have to go back for more another time. While many builds were extremely interesting, very few seemed to use particles. Those that did were generally not the greatest. But there were a couple that caught my eye. This display was an interesting firework particle effect. 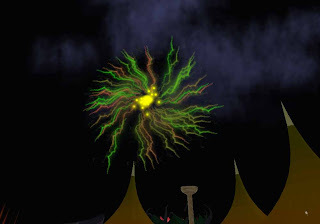 An unusual spiky texture was used to form the explosion, while another effect shot up from the ground to trigger the explosion. By far the best particle effect I discovered was this amazing whirlwind. Actually there were several that randomly wandered through an otherwise empty area. You can’t quite see it in the still image here, but it was twisting and rotating at great speed. Dust picked up from the ground swirled about the base. Very realistic, and very well done! After all that exploration, it was time for a rest. Or something. A while ago I posted hints for running your business after you die. Morbid, for certain – but a necessary consideration for anyone doing serious work in Second Life. This post is a bit of a follow-up that offers you a template that you can use to manage your post-Second Life non-existence. Here’s what I mean. You’ve spent many hours in Second Life, establishing strong bonds with interesting people, building businesses, coordinating massive events. What happens to all those friends, that stuff and your events in progress? You may have close friends or relatives in RL that are already aware of your SL existence, but more typically they will know nothing. In that case all things fade away in a terribly ungraceful and wasteful manner. But what if you could ensure that at least some loose ends were properly tied? To do so you’d have to make arrangements with one of your survivors to take the appropriate actions, but generally I suspect that your survivors won’t have a hot clue what Second Life might be, let alone being able to deftly handle your virtual affairs. My idea is to ensure the right things take place, and the only way to do that is to make certain your survivors know what to do and how to do it. But how could your RL survivors know what to do? Simple – you must hook them up with avatars who can help them deal with the situation. In other words, you have to enlist several trusted friends who you believe will be capable of assisting your survivors execute your instructions. I say several because you don’t want to count on only one; you’re not the only avatar that might disappear, after all. The key is to provide your survivors with very specific instructions. I’ve written a template in text below that you can cut, paste and edit for this purpose. Not every section is appropriate for everyone; use what you need. Once you’ve completed the form, sign it, seal it in an envelope and give it to your RL survivors, indicating that it must not be opened until you are dead or incapacitated. To be opened only in the event of my death or incapacitation. If you are reading these instructions, it means the worst has befallen me. Please read the instructions below and take them seriously. As you may or may not know, I have been involved in an online service called “Second Life”. Normally the use of an online “game” would not warrant special notice, but Second Life is not a game. It was such a significant part of my life that there are certain actions that must be taken by you in order to wrap up my affairs, since I can no longer do so. 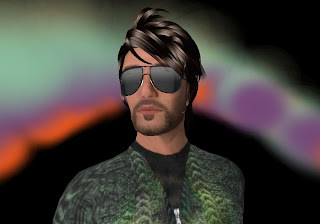 In Second Life, I have certain obligations to fulfill, without which my Second Life assets may be in jeopardy. You must, with the assistance of my trusted friends, ensure these obligations are kept at least until the assets are disposed of. This is obviously a trying time, and I do not wish any extra work for those cleaning up my affairs. However, even though the Second Life environment may be invisible or unknowable to you, it is indeed very significant and cannot be ignored. Thank you for all this work, from myself and the virtual friends you do not know. Needless to say, you probably should update your form at least once a year or when ever a significant change to your virtual life occurs. That’s right. I believe there are two separate economies at play within Second Life. Sure, there is a single monetary system based on the friendly Linden Dollar, but it’s clearly being used in two ways. The first way is as one might suspect, casual in-world transactions between avatars. What’s so unique about that, you ask? It’s the magnitude of the transactions: they are all small. For example, a pair of virtual pants might cost 299L – approximately $1 in “real” funds. The pants are so cheap because they are virtual and perhaps have less utility than “real” pants. And so it goes. Many things are priced at this microscopic scale. Cars, boats and other vehicles are available for a dollar or two. Good ones may cost you $8. Oops, I mean 2000L . Two Thousand sounds a lot bigger than 8, doesn’t it? The Linden Dollar has a small intrinsic value because it is addressing a micro-economy. Goods and services are bought and sold, but their prices are microscopic compared to real world rates. Many residents allocate a small portion of their real dollars towards virtual activities and expect to have a full and fun virtual existence. They can, because there are virtual business owners who sell them goods and services at a micro-economy rate. Pants are indeed for sale at 299L. Who would buy them if they were priced at the shocking rate of 24,000L, equivalent to the price of a fancy real life pair? But then there is the “other” economy. The one where the real world intrudes on the micro-economy. Some real-world businesses have thought it possible to make money in Second Life. By “make money”, they mean “make money at real-world rates”. Is this possible? Perhaps, but it’s going to be difficult because the majority of the SL economy is at micro-economy rates. It’s like selling those pants for 24,000L, and expecting to sell a lot of them, too. Real world companies thought they could get around this conundrum by selling atomic goods in the virtual world: buy a real PC or shoes at a virtual store and have them show up at your door. I don’t think that approach worked out very well. Perhaps it’s because of the collision of economies. Problems do occur when the two economies collide. For example, if someone is making their entire RL income via SL, they have a right to charge RL rates. However, those expecting the micro-economy are in for a factor 250x shock. But remember, the seller is not overpriced, and the buyer is not too cheap. They are simply nodes of the two economies crossing paths. They should keep going and look for buyers and sellers within their own economy. I know several business owners who recognize this principle and explicitly price their goods and services towards one economy or the other. They would feel uncomfortable pricing their items any other way. Neither economy is wrong, they are simply different. What’s the moral of this story? When you are selling in SL you must decide which economy you wish to belong to. Then set your prices appropriately. 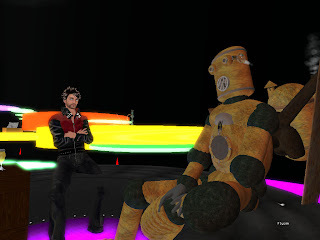 This past weekend I attended the annual Second Life Community Convention for the very first time, and for me it was a major transition in my real and virtual existence. The event was full of profound moments, both personal and general. I saw, I listened, I met, I learned, I transformed and I belonged. For you who have not had the opportunity to experience this event, you have missed something, something terribly important, something that is or could be part of your virtual existence: a true, deep and honest sense of belonging. We all belong to our virtual communities, and we truly feel part of them. But there is a higher level that we cannot experience through normal virtual channels. At SLCC the atomic reality channels were opened to their fullest extent. I awkwardly wrote my avatar name on the name badge, and at that very moment I became ArminasX. Confidently, I strode down the conference halls, with an unfamiliar swagger eerily similar to my AO. But my graphics system displayed humans, and I saw no avatars. Name badges, when intermittently readable, were of no assistance as they spelled out avatars unfamiliar to me. No name recognition, no face recognition. Nothing. No one. A prearranged meeting with avatar Bevan Whitfield triggered it all. We met in the lobby, and she directed me to a patio table where avatars were sitting, just as they do in virtual reality. I stood by the table and said, “Hi. 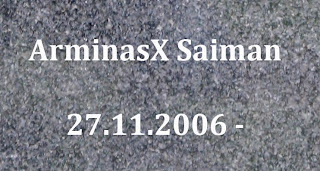 I am ArminasX.” They introduced themselves and transformed from anonymous atomics into friendly avatars, even if I had never met them in-world. Discussions of all topics ensued and did not cease until the final moments of the convention. And those discussions were invariably momentous, memorable, astonishing and truly surprising. You see, our virtual world is composed of things people built. Every single item, object and texture in every parcel on every sim was made by someone. Someone creative, and some who are very creative. Those creative people were the attendees. Without a single exception, each and every person I spoke with was amazing. They ALL were doing something spectacular, interesting, gigantic, familiar or incredible. It was greatly humbling to look around during the keynote session and realize that these hundreds of brilliantly creative individuals were only the scant few who were able to attend, and that many times that number remain out there, out there in virtual reality continuing to build our new world. Meeting LifeFactory Writer, an up-and-coming machinima artist, whose new short film has been seen on CNN and was invited to enter the prestigious Cambridge Film Festival. And then learning that my Sunflower particle effect was used in that very film. LifeFactory has a sticker on her laptop of the Sunflower scene. Meeting Heidi Ballinger, the woman from Denmark who is changing her legal name to her avatar name (Ballinger). Why? Because her online presence in multiple services is so pervasive that no one actually refers to her by her real name anymore. Meeting podcasters Daphne Abernathy and Crap Mariner and seeing the faces behind the voices I have heard so many times. It is eerie to be so familiar with someone you’ve never seen. Meeting the Metanomics crew, including mastermind Professor Beyers Sellers, Bevan Whitfield and others, with whom I often found myself hanging with until extremely late hours. Having dinner with Nonny Writer, another machinima producer. Hanging out with Kerria Seabrooke, Chosen Few and the rest of the machinima gang who did the CSI TV episode and many other famous and groundbreaking machinima shorts. 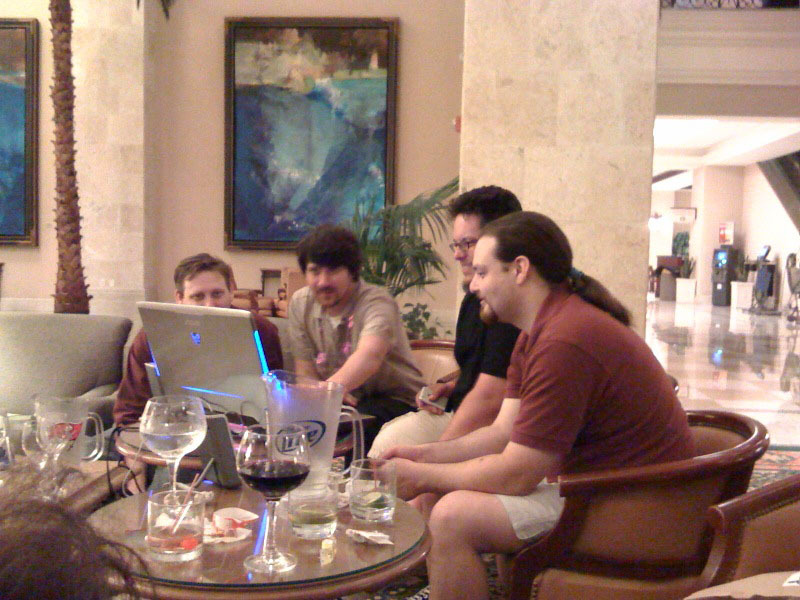 These guys cracked open the largest frigging blue-and-red-neon-adorned, satellite-speakered two-inch-thick laptop ever seen in the hotel lobby at 3AM and showed us their work. They love their work so much they live it 24 hours a day and were even vid-capturing our lobby party non-stop. Being told that Nonny Writer was nominated for an Academy Award. And realizing that I had dinner with her the previous evening. Being in the room during an epic but very subtle confrontation between the OpenSim team and Linden Lab regarding the future of asset transfer between the Second Life grid and independent OpenSim servers. Discussions with those in the know afterwards described it as a “defining moment” in the history of the 3D Internet. The future course of events is now set in motion, and I was there when it happened. Learning how many people have heard of my work, my store and my blog. “Electric Pixels? That’s a great brand!” one person said. Crashing a suite party put on by Honda to demonstrate a new AI system under development, and encountering numerous friendly Lindens. No, Torley was not there, but every Linden I met was extremely friendly. The highlight, however, took place on the suite’s balcony where a certain individual was revealed to the world. Realizing that many attendees actually never slept during the event. Many people “budgeted” only a few hours or a single short sleep to maximize their interaction time. “I slept on Friday”. And then realizing that I was one of them. Liveplurking the Philip Rosedale and Mark Kingdon keynote address. As the speech began, I plurked that I was watching, but then realized I could provide live updates by adding responses as interesting statements were made. To my astonishment, discussions and feedback occurred in the plurk while the speech was still in progress! It was a bit busy for me to do this entirely via iPhone, but I got it done. I was told later that Second Life IMs were flying around directing people to observe the plurk Right Now and that perhaps hundreds of people were reading it live, seeing the words of Philip and Mark as they were spoken. You can see the entire plurk here. And if you have not yet signed up for Plurk, do so here at my page. In fact, I ended up plurking quite a bit during the event throughout my timeline. Spending 20 minutes chatting alone on a balcony with a very sharp lady about issues and solutions for SL. And then realizing it was Robin Harper/Linden. Meeting The Internationals. I guess I am one too, but because of that I felt an extra bit of affinity to those from far away, like Mariis Mills from Denmark, and Dr. Yesha Sivan (Dera Kit in SL) from Israel who are now good friends in all dimensions. Meeting amazing builders, organizers and artists like Sami Tabla of SL Exchange, virtual financier IntLibber Brautigan, builder Angelle Marquette, organizer Coughran Mayo, musician Cylindrian Rutabaga, Luskwood founder Eltee Statosky, Holdeck inventor Loki Clifton, DJ and SLCC organizer Nexeus Fatale, developer Peter Newell, broadcaster Starr Sonic, virtual magician Tuna Oddfellow and his beautiful assistant Shava Suntzu, Dancing Ink Productions’ Eureka Dejavu and Schmilsson Nilsson and many others. Meeting educators like Kendall Vantelli and JS Vavoom who are using the virtual world to make the real world a far better place. Networking throughout the event via SMS, Flickr and Plurk to coordinate activities. It was a common sight to see laptops uploading pictures during sessions, tweeting or plurking. The vortex of electronic communication made my visit very smooth indeed. Meeting the famous Stroker Serpentine, mastermind of the SexGen series of “personal animations” and associated gear. Stroker put on a rather unusual offsite party, in which all manner of unusual activities took place, astonishing outfits were worn and door prizes that were totally unsuitable for carrying across the border home were awarded. Meeting master builder and artist Eshi Otawara, whose tragic tale is surpassed only by her courage, artistry, humbleness and sense of humor. I spent many hours with Eshi and she is a true friend that I am very glad to have. And she gives a killer massage, too! As the convention drew to a close, I reflected on my experience and realized I had a familiar feeling. It was like a high school or family reunion. Of people I did not know, but now do. I now belong. And you can, too. I've frequently written on the topic of reality, specifically those rare moments when your virtual life collides unexpectedly with your real life. Yes, those moments are rare and special. This weekend I expect to have many of them, because I'm heading to Tampa for the Second Life Community Convention. It's the first such convention for me, although in the past I've attended many other conventions and conferences (and even presented at a few). As one typically does attending a conference, you must make arrangements such as hotel reservations, airline tickets, packing clothes, making plans, etc. But this experience was just a bit different than your average conference prep. Persona. Exactly who am I when I attend? Am I ArminasX, with his unique personality and habits (some bad), or am I me? I must decide, and quickly. Or perhaps I am both. Hmm. Attire. Again, whose style should I follow? Mine or the avatar's? Plurk friends suggest taking my in-world full-body red and black latex outfit, but somehow I am not certain that would be appropriate in the blistering Florida sunshine. If I had one, that is. Anonymity. In SL it is relatively easy to be anonymous, if only for a while. This could be a little different when faced with actual atomics within photon range. Do you give them a business card? What should be on the card? Are phone numbers appropriate? Should you not give anyone anything? Recognition. I had the startling revelation that I actually have no idea who anyone is or what they might look like. In other words, I could walk into a room and would recognize no one at all. There won't even be names and titles above their heads! Somehow these issues will be resolved, one way or another. Stay tuned for an on-scene post, assuming the WiFi works. In part one of this series, I proposed the theory that our in-world economy is having a few issues. This is reflected by lower revenues by seen by at least myself, and evidence from multiple other in-world businesses. Recently New World Notes ran a poll that indicated a slight majority of businesses were experiencing a downturn. In a healthy economy, a large majority of businesses should be expanding, not shrinking or remaining stable. Let’s try to identify what could be done about it. Increase machine accessibility. Windlight requires more hardware than many people seem to be able to provide. Solution: a dumbed-down viewer that runs smoothly, but displays less graphics fidelity. Is this as simple as setting graphics settings to less power-hungry defaults? Possibly. The Low-Mid-High-Ultra graphics slider is a good step, but obviously it is not nearly enough to counteract the tribulations of users who appear to be avoiding SL. I still encounter people who insist on running older viewers and others who claim they “don’t have a good enough PC”. Meanwhile, other virtual worlds have astonishingly low fidelity graphics (even comical 2D in some cases) and yet they have very high participation. Can’t we share our virtual world with those running viewers that can’t see quite as well? Instead of shutting out those users completely, why not let them “graduate” to better viewers over time? If they can use SL even in a simpler mode they might join SL instead of joining other simpler virtual worlds (and never trying SL). Reduce Viewer Complexity. While we’re talking about the viewer, I have to say that the sheer complexity of the interface certainly scares off a large segment of the population. Just as people can survive without fancy graphics, they can surely survive without most of the controls. Think about it: how many buttons, knobs, sliders, menus and selections are available? Dozens? Hundreds? Thousands? How many of these do you Actually Use in normal activities? Very few, unless you are a content creator. For most users, just hide them. Users truly interested in them can turn them on when they are sufficiently competent, while the majority of new users would be less inclined to give up. By the way, a significant new initiative has started up, independent of Linden Lab, to address this: http://imprudenceviewer.org, which I hope will either solve or provoke a good answer to this important issue. Rectify Asset Server Issues. As many regularly online residents may have noticed, these problems and associated official bulletins cause residents to avoid transactions, including purchases. Not good for business. The obvious solution here is to repair the asset server software and/or hardware configuration so that it is has consistent and trustworthy reliability. I don’t know the specifics of the technical issues, but Google and others have proven that it is quite possible to implement massively scalable real-time databases. If they can do, so can Linden Lab, and perhaps even with the same software. 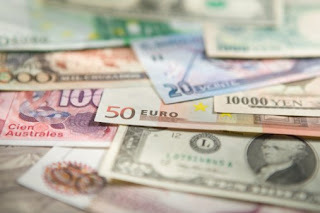 Improve Real World Economic Conditions. Off-world, recession in the US and other countries looms, shrinking the available capital to spend in-world. There’s not much that can be done to counteract this issue, other than waiting. Lowering the price of entry to the virtual world and raising the overall attractiveness of SL so that more people try it out in spite of economic conditions could help, but I think that's been done already: free accounts are available. Also, the ongoing virtual population is still far lower than the real world, and there are many people who could take part even in bad economic conditions. Reduce Tier. For all the chatter about the price of land, I believe the key factor in the economy is monthly tier. A business must produce more revenue than tier, every month or it becomes nonviable. The tier price affects everyone, even those who do not own land, since ultimately the tier is passed on to all renters and shoppers. I’ve observed businesses that operate at or near break-even levels, and these ventures are highly susceptible to variances in revenue. In other words, those businesses fail if their revenue happens to drop too far below tier. The solution: lower the tier, particularly on islands. Yes, it’s a major source of revenue for Linden Labs, but it could also be the major barrier to economic growth. Imagine how many businesses might not have failed if the tier were say, half of the current rates. Will any of this come to pass? I have no idea, but I certainly hope some of it does. Especially reduced tier.